Artist's rendering of galaxy BX442 and companion. With apologies to the universe, baby galaxies aren't very cute. They're blobby, asymmetrical fuzz balls, seemingly more goo than coo. It's only later  several billion years later  that many of them mature into the exquisite pinwheels we see on posters and screen savers. Of the thousands of galaxies telescopes have spotted in the most ancient sections of the sky, not one of them looked like anything other than a fuzzy blob. That's why astronomers are excited about a captivating new discovery: a face-on, full-fledged spiral galaxy that's a staggering 10.7 billion light years away  meaning the image is 10.7 billion years old. That dates back to a time when all other known galaxies were still in their nascent, clumpy stages. This one, by contrast, has the defined spiral arms no one thought could exist just three billion years after the Big Bang. "It's not as big and beautiful as the spirals you'd see in the modern universe because we don't have as much resolution on it," says astrophysicist David Law, a postdoctoral fellow at the University of Toronto, "but it's something we never expected to find 10.7 billion light years away. It's just incredible that we can see so much detail at that distance and that time in history." The galaxy, generically labeled BX442 and described in the July 19 issue of Nature, was actually discovered years ago, but it was not until 2011 that astronomers got a good look at it. That was when Law and four other astronomers were combing through images from a Hubble Space Telescope survey of more than 300 galaxies and spotted one with an unusual spiral shape in a part of the sky that should be home to no such thing. They first assumed they had made an error calculating the galaxy's distance from Earth or that after they had viewed so many galaxies, their minds had simply created a false spiral pattern from two disk-shaped galaxies that happened to line up just right. Then late last year, using a spectrograph at the Keck II telescope atop Hawaii's dormant Mauna Kea volcano, the researchers analyzed light streaming in from the entire region of space in which the galaxy is situated. The ultra-sensitive spectrograph diced the starlight 3,600 pieces, revealing precise changes in its wavelength  the so-called Doppler shift that helps investigators pinpoint how far away an object is and how fast it's retreating from Earth. That confirmed that BX442 was indeed as distant as it seemed to be. In order to confirm that the galaxy was truly the spiral shape that the Hubble image suggested it was, Law and his colleagues had to play with light another way. Ordinarily an object that's nearly 11 billion light years away is hopelessly blurred in ground-based telescopes because Earth's atmosphere jiggles incoming light at a rate reaching several thousand times per seconds. The Keck, however, is equipped with small actuators on the back of a deformable mirror, allowing the reflective surface to be bent and adjusted at the exact same rate, canceling out the atmospheric distortion. That gave researchers a very Hubble-like peek at BX442 and the spiral arms popped into view. But how did the galaxy grow up so fast? Galaxies spin for the same reason the Earth does: angular momentum that imparts a permanent rotation as primal dust contracts into discrete bodies. That motion, all by itself, can help give a galaxy shape. But so too does the gravitational interplay of the billions of individual bodies that make up the galaxy  at least usually. However, Law and his colleagues believe that BX442 is so thick that random motions within it would overcome those sculpting forces. Instead, BX442 relied on something else: a companion dwarf galaxy situated close enough to have a gravitational influence of its own. Law believes the unnamed companion, which appears as a tiny blob in images and is only about 2 percent of BX442's mass, is exerting enough of a gravitational effect to form the spirals. "In the modern universe, that tidal effect seems to be a mechanism for producing the most eye-popping 'grand design' spirals, and that's exactly what we're seeing with BX442," he says. "It's probably telling us the importance of mergers in helping produce or at least accentuate the spiral structure we see in galaxies." 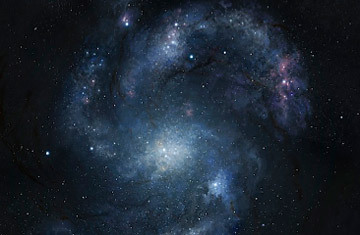 The Milky Way too is attended by a dwarf galaxy, which may have played a formative similar role. The work on BX442 is not done. Law hopes to collect additional images using a variety of filters and wavelengths, which would help reveal the composition of the galaxy's stars and enable astronomers to look even further into its past  determining for example, how much earlier its central bulge formed than its surrounding disk. That's a puzzle that lies at the heart of galactic formation, but also one that's hard to test. "In this case," says Law, "we'll be able to see the ages of the stars in different regions, how the stars have different chemistries, and [thus] how much earlier the bulge formed." All that makes BX442 a Rosetta Stone for galaxy formation, if only for a short time. "If we've found one then there's probably a bunch of others that we haven't found," Law says. Until they do turn up, BX442 is one of a kind  shedding a new light on the dim past of all its galactic kin.